Nouveau Floral is the unofficial name of this pattern. Nouveau Floral came with a serving trivet. “Whatever the occasion, it’s always right to give PYREX Ware!” exclaims a 1969 “New Gifts” catalog. One of these new gifts was the unofficially named “Nouveau Floral” pattern. Nouveau Floral was referred to as a Round Casserole with Trivet, but did not have an official pattern name. 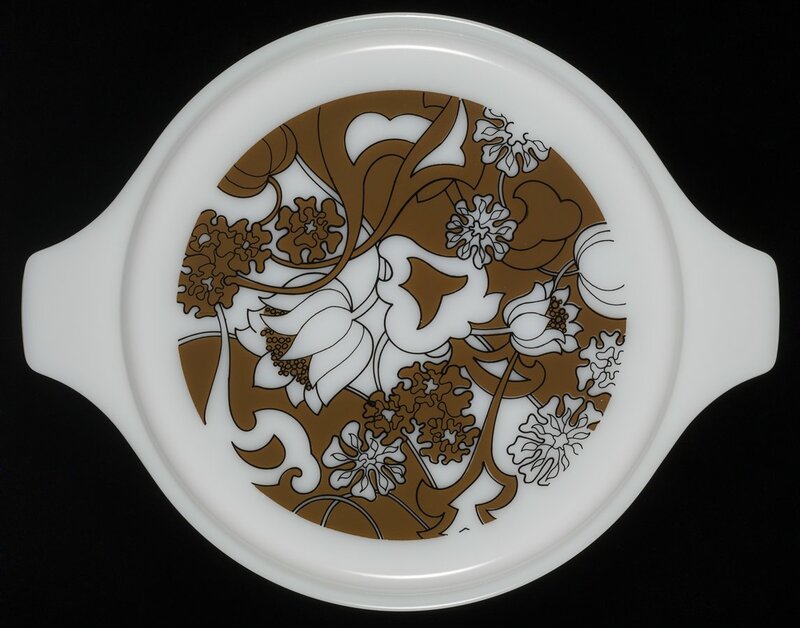 Released on the 2 ½ quart Round Casserole (475), Nouveau Floral came with a brown plastic serving trivet. Nouveau Floral has a brown, black and white allover exaggerated floral design printed on an opal ware lid while the casserole is a cheery yellow. Upon its release, Nouveau Floral retailed for $5.95. Corning Glass Works offered its first patterned opalware gift set in 1953 when the Heinz Baking Dish was sold in grocery stores. Widespread distribution of promotional patterns occurred after the overwhelming success of the 1956 release of seasonal “decorator casseroles.” Using existing Pyrex shapes, gift sets featured new patterns offered for a limited production time. They often came with mounters, cradles, or candlewarmers and were advertised in the spring to appeal to Mother’s Day and summer wedding shoppers and in the fall to give the holiday gift-buyers something new. Corning continued to produce gift sets through 1983, creating nearly 135 different gift set patterns during that time. Corning intended these pieces to be sold for a limited time, and directed retailers to remove older, unsold promotions from the shelves. Often, patterns used for these gift items were unnamed, or given names descriptive of the dish’s purpose, like “chip and dip set.” Collectors over the years have assigned names more reflective of the specific pattern. Click to view objects in the CMoG.org collection browser.